Through the 100 decks that we had, we had one that had the Library Access and Nepenthe Seed combo. This combo has received a lot of hype and a lot of scorn, and we finally had a chance to try it our for ourselves. Does the combo live up to the hype? Does the deck need Phase Shift and Key Charge to win? How reliable is it? One Sentence Summary: You don’t have to draw the entire deck to win the game. I’m highlighting this card and not either part of the combo, since the Challenge is what wiped Robert’s board. Notable Event: The Library Access and Nepenthe Seed did a lot of work, but didn’t draw the entire deck. It did draw enough cards to crush the rest of the game, as the following Brobnar turn was absolutely devastating. OSS: Its difficult to use creatures that are alternating between stunned and dead. This card provides board control AND generates aember. 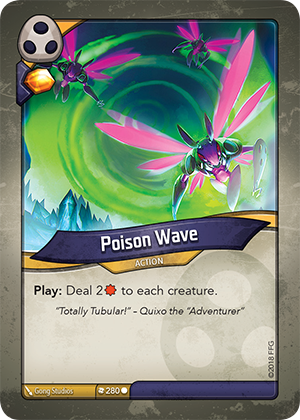 Rockmon is well positioned to make use out of the three Poison Waves, with Mack the Knife and Seeker Needle. NE: Blinding Light and Poison Wave choked out the board, turn after turn. The combination of the two makes the opponent want to overextend to get around the stun, and then get punished by the Waves. OSS: If the Nepenthe Seed and Library Access don’t win the game, the other 34 cards can. One thing we’ve noticed in all of our games, Brobnar decks with no ability to fight immediately tend to suffer. Gauntlet provides that much needed aggression, and then doubles as aember generation after all of the opponents creatures are dead. Gauntlet also serves as an excellent way to clear stuns. NE: A Yo Mama Mastery was played on a Troll in the early stages of the game. That Troll lived for the rest of the game, and easily healed twenty or more damage. OSS: Gloriana came back from a two key deficit to win this game. A lot of cards contributed to help Gloriana win, but I think Anamoly Exploiter deserves the nod. Gloriana’s creatures were outclassed for most of the game, but Anamoly Exploiter took out a lot of problems, including a Gatekeeper with 6 captured aember. NE: For much of this game, Roberts had a lot of Gloriana’s aember captured. OSS: This game is a case study for why people dislike the Nepenthe Seed and Library Access combo. Once again, I’ll avoid either of the combo cards in lieu of the card of another card. NE: Yes, the game was close. Yes, the combo turn won the game. To hit the Library Access after shuffling the deck was a lucky draw, but the following turns would have been disgusting anyway. Gloriana was going to have to start the turn with 6 time 2^6 aember to get past the Effervescent Principle that could be Ruled of Sixed. This game is also notable because it is the first time we called a game without playing it out, since the outcome was close to deterministic. OSS: Rockmon killed Roberts with his own toys. Nexus just punishes board with a lot of artifacts. In this game, he picked up a Duskrunner to make pile on. He used Special Delivery and Subtle Maul to do rude things to the opponent. NE: Nexus going unanswered for several turns was the big swing in this game. He was eventually sent to the Oubliette, but the advantage gained during that time was too much to come back from. The Nepenthe Seed and Library Access combo is, in fact, worthy of the hype. There are ways to force the deck to play fair, and this deck had to win it’s second game without the combo. This deck was on the ropes in the third game, and it proceeded to fight out of that hole to win the game in a dominating fashion. While powerful, I do think that there are things that players can do to fight these types of decks. 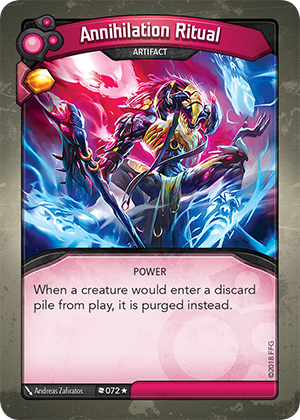 Artifact disruption is key, since Nepenthe Seed is vulnerable to cards like Poltergeist or Nexus. The fact that the deck won a game without the combo proves that the deck is solid and doesn’t rely on a gimmick to win. The Brobnar here is the kind of companion you want to the rest of the deck: brutal board control. This deck has a lot of tools at its disposal, and its record is an accurate reflection of how good it is. This deck could be an early favorite to win the whole tournament. This deck is quite good at forcing the opponent to overextend on the board, and then killing all of those creatures with a Coward’s End or Poison Wave. Epic Quest feels dead in this deck, but Cleansing Wave pairs nicely with Poison Wave. There is a lot of aember burst in this deck, since Smith and Virtuous both give half a key. Mack the Knife is an incredible card, and with Seeker Needle, lower power creatures are more of a liability than anything else. There is a solid amount of cross-house functionality, since Gauntlet of Command and Commander Remiel let you utilize your other houses. There is not a lot of stealing for a Shadows deck, but Bumpsy, Grenade Snib and Krump provide some complimentary aember destruction. This deck is weak to large aember bursts, and might find itself in a race in future rounds. This deck fell just short, and really had a hard time generating aember. Truebaru is a cool card that just doesn’t work against deck that have a way to return it to the hand, and this deck never lined up Hecatomb to go with it. This deck was the deck closest to beating the Library Access deck in this pod, but there isn’t enough disruption here to stop that deck reliably. Dominator Bauble is a good way to use the creatures that Overlord Greking takes. There are some cool synergies in this deck, but nothing that will crack a game open on its own. Arise! is solid in this deck, and Regrowth makes it easy to play some of the problem creatures over and over. The deck has a hard time fighting for the board, and that could be part of the reason it struggles with Aember Generation. There are twenty creatures in this deck, so it relies heavily on them to make aember. With no true board wipe, this deck can fall behind on board control and then struggle to catch back up. Very little aember control in this deck makes it difficult to put enemies off keys. This deck simply struggles to generate aember. There are lots of controlling aspects of this deck, but it isn’t good at closing out games. This deck could really use a Virtuous Works or Ghostly Hand. The Dis in this deck generates only two aember from playing cards, and relies on Dust Imp dying or reaping to generate enough to forge a key. The deck also found itself with extra removal and no targets, making a lot of hands awkward and forcing the player to decide to discard powerful cards. It is possibly this deck was the victim of a high-powered pod, but it is equally possible that this deck is just not good. It is also possible that this deck is a little more complicated than a normal deck, and more playing with this deck would reveal a better way to play it. Known Errors: Once again, Dextre shows up here. Our games from our Boxing Day episode are located here. Justin’s most disappointing deck of all time is found in this pod, along with plenty of Bait and Switches, Key Charges and more. We answer all of your questions: Is having three Witch of the Woods in the same deck a good thing? How many robots can get wedgies in a single night? How many times can Nathan lose to Bait and Switch? One Sentence Summary: Friendo was the victim of the largest Bait and Switch on the stream yet. Yep. You don’t need me to tell you about this card. Notable Event: After the most disgusting Bait and Switch of all time, Friendo used Mimicry to copy Miasma to try to buy a turn. Velosin started the next turn with a Key Charge to put the game away. 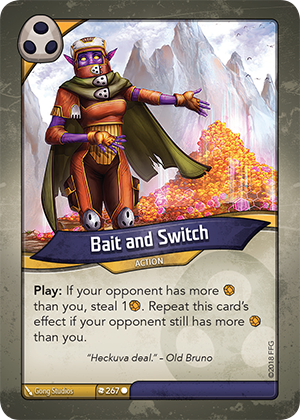 OSS: Whatever game Ohmbryn was playing, it wasn’t Keyforge. Oldenstead was light years behind on the board, but Glorious Few generated 6 aember, and put the deck over the top. NE: Ohmbryn put a Witch of the Wilds into play with a Witch of the Wilds, and then did that again. While powerful, this didn’t generate any aember or stop Oldenstead from generating aember. OSS: Velosin gave Ohmbryn a wedgie. This card was responsible for a big aember swing headed into the late game. These “hate” cards are narrow, but are devastating when they land. NE: Ohmbryn was very close to forging the last key, but a Bait and Switch followed up by a Nerve Blast put Ohmbryn down to five. OSS: Friendo played lots of creatures, but that didn’t stop Oldenstead from generating aember. For a card with no text, this does a lot. NE: Glorious Few once again generated a ton of aember. OSS: A brutal turn transformed a close game into a not close game. This card was the final dagger that put this game away. Its easy to forget to play around this card, and even when you play around it, it still generates a lot of aember. NE: The aforementioned turn involved a Bait and Switch, Nexus activation, Nerve Blast, One Last Job and a Ghostly Hand. Just disgusting. OSS: Friendo got a full turn of Crystal Hive activation after all the coward’s were ended. This is the card that you don’t see in Martian Decks people complain about. 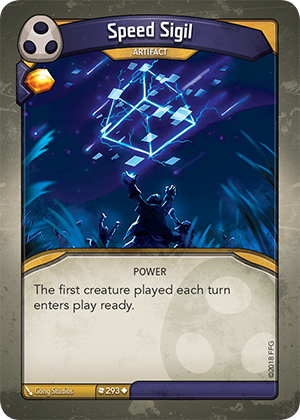 Crystal Hive card can generate a lot of aember, and represents a large threat if your opponent loses control of the board. NE: A Coward’s End cleared the board, which Friendo needed. 8 of Ohmbryn’s creatures were killed, which makes the chains a little easier to bear. The Shadows portion of this deck is devastatingly good. It might be safe to say that this deck is mostly a conduit for the brutal aember stealing cards, since the Untamed portion does not stick out and the Brobnar section provides only a moderate amount of board control. Key Charge is always nice, and combined with Miasma, it makes your opponent never quite understand fully how close you are to winning. There are a lot of creatures that want to fight in this deck, with the Macis Asp, Dodger and Mushroom Man joining the ranks of the Brobnarians. This deck can generate bursts of aember from all three factions with Smith, Ghostly Hand or Full Moon. Overall, Velosin is a deck that does a lot of things well and it isn’t hard to see why it swept the pod. This deck is light on creatures, but heavy on Aember generation. I don’t think it is a coincidence that the game it lost was the one where it played Speed Sigil. While the creatures in the deck are few in number, two Blood of Titans and a Banner of Battle makes sure that they will stick around for a while. The aember control in this deck is quite strong, even if Take Hostages is a little weak due to the low amount of creatures. There is a lot of targeted removal between the Mighty Javelins and the Pawn Sacrifices, so this deck doesn’t have to rely on fighting to kill problem creatures. This deck specialized in playing Glorious Few for silly amounts, and Smith and Virtuous Works are both workhorses in the same vein. This was a fun deck, but certainly can’t win every game it plays. This deck has a lot of play, even if it’s record here was disappointing. Its first game was a blowout because of Bait and Switch and Miasma, even though it generated a ridiculous amount of aember. If this deck gains control of the board with two Crystal Hives and some Martians, it can generate aember at levels that only Drumble and Doorstep to Heaven can deal with. There is a solid amount of aember control here and the ability to force your opponent to pay more for keys is always good. 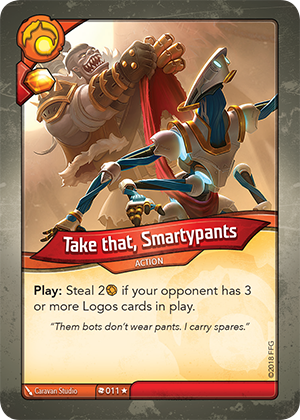 Grenade Snib, Krump and Three Mindwarpers can attack the aember your opponent has, while Lifeweb and Take That, Smartypants have the ability to steal aember in rare circumstances. Mimicry is an incredible card, as always, but this deck really wishes it had access to Key Charge or even Key Abduction to help it close out games. The first thing that should be said about this deck is that it is a lot of fun to play. This deck is really exciting, but it simply just can’t stop piles of aember from winning the game for your opponents. This deck kept finding itself in games where it would have a ton of creatures, but way behind in the aember race. Three Witch of the Wilds is pretty exciting, but this deck struggled with ways to stop the opponent from running away with the game. 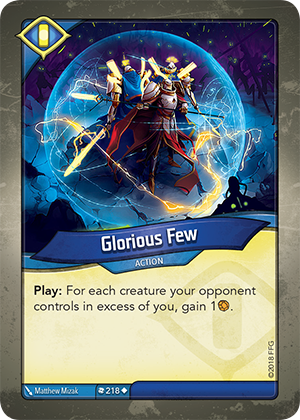 Glorious Few is pretty bad in this deck, but Full Moon is silly. Library Access had trouble doing anything relevant, but there are potential games where it could lead to really degenerate turns. This has to be one of the most disappointing decks we’ve played, since the things it can do are really fun, but it just never wins a game. Known Errors: Justin started the final game without flipping over the key that he had forged from the previous game. This was eventually caught, but it is misleading for the first part of that game. We recorded this pod on Christmas Day, our present to you. We had a deck that had some strong combo elements, one sneaky towel, a secret agent and an someone who built flying saucers. Our usual spread of wins appeared again tonight, with one deck undefeated, one deck winless and the other two in-between. Another key point, Sanctum cards seemed to be a common thread among decks that won tonight, so expect to see those highlighted. One Sentence Summay: Prowl Towel filled the board with Sanctum creatures that Rasmussen could only ever answer in a temporary fashion. Both sides played this sturdy lad, and this game demonstrated how much resilience two armor and 6 power gives. 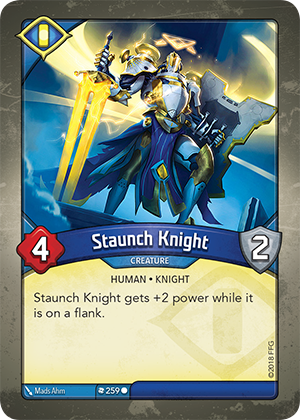 Staunch Knight’s downside is that he asks you to play around his ability, but that has never seemed to be difficult. Staunch Knight always costs a disproportionate amount of resources to remove in combat and threatens to kill so many creatures. Notable Event: A Lost in the Woods managed to get rid of some of the large Sanctum creatures that were holding aember hostage, but they eventually came back. Rasmussen’s creatures were outclassed most of the game, and there was never an opportunity to try to set up Epic Quest. OSS: Radia first shot creatures with bullets, and then shot them with healing waves of energy. There’s a strong chance this is the best card in Radia’s deck, and that is in part thanks to Autocannon. Cleansing Wave has been good in other games, but when paired with Autocannon, things start to get silly. 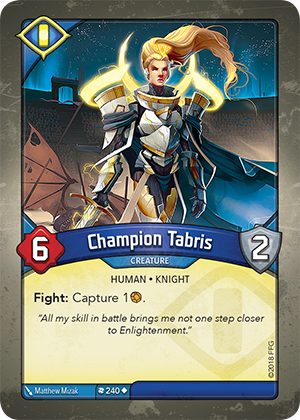 NE: An Uxlyx the Zookeeper captured a Champion Tabris who had been terrorizing the board since the first turn. That Champion had captured three aember, and as long as she stayed on the board, Saucersmith was not going to forge a key. OSS: Prowl Towel and Saucersmith lined up creatures, and Prowl Towel’s were much better. Yep. So far each card of the match is a Sanctum card. 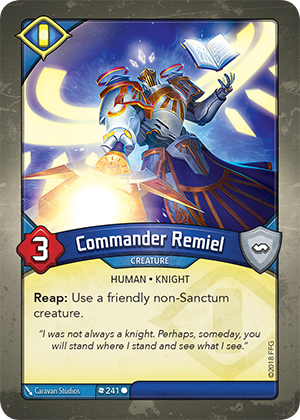 In this game, Remiel picked up a Shoulder Armor and essentially could never be answered. He then proceeded generate value for the whole game. Remiel allowed Towel to generate aember while still fighting for control of the board. NE: An early Control the Weak from Prowl Towel essentially forced Saucersmith to skip a turn. Events like this can shift the momentum in a game, and Prowl Towel won the game the turn before Saucersmith could reap with a board full of Martians and Crystal Hive. OSS: Rasmussen came very close to beating Radia at her own game. How’d this get here? This isn’t a Sanctum card. Hysteria reset the board when it got complicated later on, and allowed Shooler to steal an additional aember and Drumble stopped a key from being forged. Hysteria isn’t good for every board state, but there are times where it is better than Gateway to Dis with the added bonus you don’t get chains. NE: Agent Rasmussen was able to use Radia’s game plan of playing Cleansing Wave against the deck for a massive aember gain early, but spent a lot of the game locked out by Drumble. OSS: Radia generated roughly twelve aember in one turn, but that wasn’t quite enough to beat Prowl Towel. 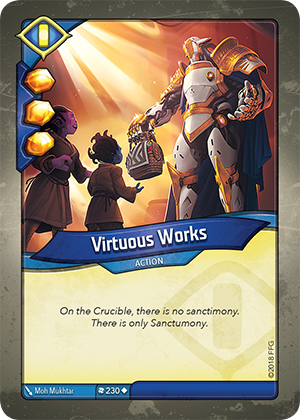 Sanctum retakes its place on the Card of the Match list. The Honorable Mention goes to Shoulder Armor, as the two combined for a nearly unstoppable creature. This creature just seems unfair when it is killing a creature and taking aember from an opponent. NE: Prowl Towel played two Arise! during the game, both times getting back two Tocsins. Those Tocsins were never allowed to activate. OSS: Rasmussen got lost in the fog on the way to this game. This card set up a brutal series of turns, from which there was no recovery for Rasmussen. Fogbank protected a Hunting Witch and Witch of the Eye, two creatures that must be killed. This game spiraled out of control quickly after this point. NE: The noted Fogbank turn was the pivotal point. Its possible that the correct play for Rasmussen on the following turn was to use Witch of the Eye and play nothing else since Lord Golgotha and Inspiration where in the hand. There is a chance that Saucersmith could just set up Fogbank and Witch of the Eye in perpetuity after that though and a Deep Probe could have hit Golgotha, so this line might have been moot. We couldn’t see this Towel coming. The Sanctum in this deck worked overtime, and has proven to be quite adept at controlling the board. This deck did not blow anyone out, so there is an argument that this deck lets opponents hang around for too long to be truly great, but the record speaks for itself. Two Arise! is nothing to scoff at, and the Shadows cards are serve their purpose. Control the Weak is very good in this deck, and Lash of Broken Dreams and Miasma will stop an opponent from running away with a game. Prowl Towel demonstrates the power of consistency over explosive inconsistency. 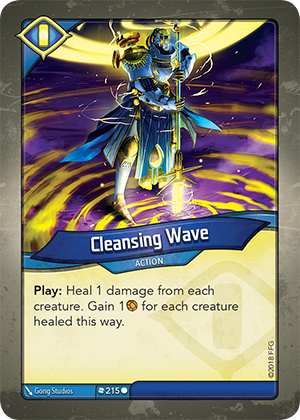 The secret for this deck is the Autocannon, since the three Cleansing Waves make for big gains. Opponents’ Cleansing Waves can be bad news, as seen in this decks second game, but the Dis gives this deck a lot of outs versus large aember gain. The Brobnar in this deck is pretty good on its own, and fighting with your creatures in this deck also sets up Cleansing Waves. Pandemonium seems like a non-starter, until you realize the Sanctum creatures have armor. 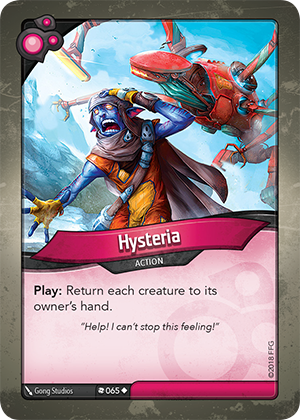 Hysteria works overtime with a lot of the creatures in the deck. This deck was barely edged out of going undefeated, so consistency is probably an issue. Decks prepared for the Autocannon will also fair a lot better than ones without it, but Radia can win a fair game on the back of its strong board presence and aember control. This saucy smith played one incredible game, and was crushed in all the rest. This deck would perform so much better with some taunt creatures, since there are a lot of small and problematic creatures that need hide from harm. The two Veylan Analysts are disappointing in this deck, since there are only two Martian artifacts. The best case for these would be to Phase Shift out an artifact when you play them, and then activate it on the following turn. The Library Access was never played during these three games, and that could just be bad luck, but it would be difficult to say that it would be enough to win a game by itself. This deck has no aember control beyond a single Yxli Marauder, and so the opponent can just step on the gas and not be punished. This deck probably ended up where it deserved, but it can accomplish some pretty absurd things when left to its own devices. This deck could take some subterfuge lessons from the linen. For a deck with Epic Quest and Key Charge, it struggled to actually forge keys in a lot of these games. In this deck, Warsong is card with a low basement and a low ceiling and this deck is cursed with two of them. The Brobnar tries really hard in this deck to help, and is probably the least disappointing third. Lord Golgotha will always be a sweet card to target with Inspiration or Anger. Cooperative Hunting and Save the Pack always seem like a better combination in theory than in practice. There is a little bit of aember disruption here, but most of it requires creatures to fight or reap, which the opponent might be able to play around. A disappointing performance, but one that could have been predicted. Known Errors: Static abilities like Autocannon are forgotten all the time. Nathan also has a bad habit of forgetting to gain aember when he reaps with Protectrix. Justin missed some aember from his Hunting Witch, but that was a game that was well in hand. This is the second part of our Christmas Eve double-header. This pod had the unusual result of three decks advancing and one deck being sent to our Worst of the Worst bracket. The last pod had a lot of games that were slowly won, while this pod might have been one of our fastest pods ever. We did experience a few interruptions due to our internet’s performance. Some of the VODs were chopped up as a result. One Sentence Summary: As one commentator put it, watching this game was like watching an experienced player beat on a new player. 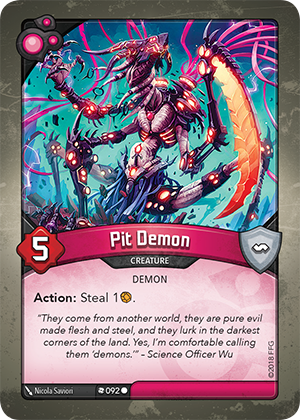 Pit Demon stayed in play for the whole game, and while there were probably other cards that had an equal impact, the persistent threat of stealing aember every turn affected how Planter had to play. Just existing on the table meant that Planter would have to end the turn with 7 aember to get around just what was on the board. Notable Event: Heartly had 6 aember captured at one point in this game. After Planter finally got that aember back, Heartly had a Bait and Switch ready. OSS: A close game got a lot less close in the last few turns. Both decks were in a dead heat, until this card was played. On a congested board, this card will just create an avalanche of aember. This was the deciding factor in this game. NE: A late game Phosophorous stars probably backfired on Planter, since the deck lost shortly after it happened. OSS: One deck was prepared to use all of its creatures the turn they came into play and the other deck was not. Heartly did some gross stuff with Speed Sigil in this game. Uxlyx, Umbra, Mindwarper and the list just goes on. NE: An early double Battle Fleet put Heartly extremely far ahead and Kalibum was playing catch-up the whole time. A mid-game Bait and Switch punished Kalibum. OSS: Planter demonstrated the power of a fully dysfunctional Mars side. This is not a card for every match-up, but when your opponent has a Witch of the Eye, you are glad that you can remove creatures from the game. NE: Mathletic had such a stranglehold on the board that it was able to activate two Pit Demons three turns in a row. There was also a sweet Neutron Shark play where it destroyed Mathletic’s own Annihilation Ritual. OSS: Mathletic’s aember disruption proved to be too much for Heartly. Doc Bookton was left alone, partly due to the number of other priority targets. Doc Bookton and Mother are similar in the way they generate value, and in a vacuum, Mother is better. In this game, Bookton drew cards and generated aember, which is the best you can hope for from your cards. NE: A combination of Lash of Broken Dreams and Effervescent Principle stopped any chance of Heartly from forging the second key. OSS: Planter showed up to this game late, and was too far behind to ever have a chance to win. Two of these hit the field and set up a brutal Brobnar turn to win the game. 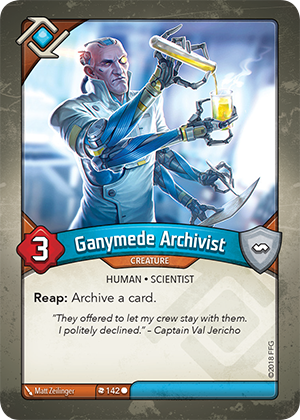 The archive is a good place for cards like Coward’s End or Smith, and the Archivist is a sneaky card that isn’t always targeted first when there are other creatures on the board. NE: A Save the Pack and a Jammer Pack kept Planter in this game after Kalibum’s Sanctum creature dominated the early game. However, a Coward’s End and a Smith put this game out of reach. 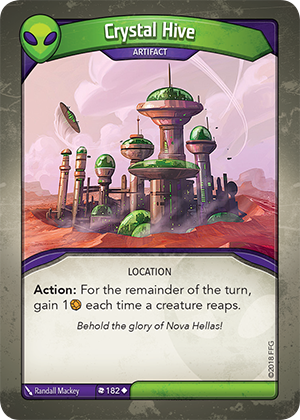 Any Mars decks with two Battle Fleets will have some nutty turns, and this deck is no exception. Heartly is missing a Squawker or Soft Landing and relies on Speed Sigil to get immediate value with its Martians. Mass Abduction, Psychic Network and Deep Probe are all strong cards that can lead to a blowout. 8 Dis creatures is a solid amount, and Arise! for Dis will always pull back enough to feel good. Annihilation Ritual is probably a dead card and Pandemonium could be hit or miss in this deck. Succubus and Tocsin provide ways to interact with the opponent’s hand. The Shadows side is quite disruptive as expected, but Carlo Phantom only has a few artifacts to work with. Two Bad Pennies is probably too many, but a Seeker Needle does provide a nice way to get value from them. This is a solid deck that will require a little experience to know when to play certain cards or when to discard them. This is a bizarre deck, but managed to qualify, so I guess that means it is capable of winning games. The strength of this deck is the ability to use cards cross-faction. Two Inspirations, Gorm of Omm, Potion of Invulnerability, Sergeant Zakiel, Transposition Sandals, Experimental Therapy, Brothers in Battle and Follow the Leader is quite an impressive list, and really feels like the glue that kept this deck together. This deck is short on creatures, but does have a lot of ways to stun opposing creatures. 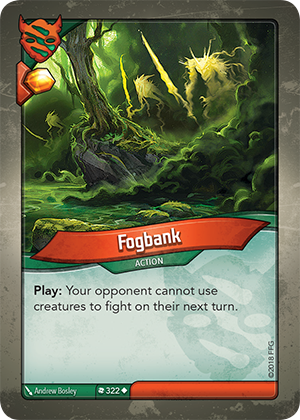 The Logos in this deck is quite adept at setting up powerful turns, and Foggify is good to keep your small amount of creatures protected from immediate harm. Blood of the Titans is a good card for this deck, since most of the creatures in this deck are small. There is some aember burst available in this deck: Virtuous Works, Cleansing Wave and Smith. Fortunately, just playing cards the other cards in this deck can generate a lot of aember. This deck is weak against other aember burst, however, since Champion Tabris, Neuro Syphon, Bumpsy and Grenade Snib are all that stand between your opponent and winning. Mathletic’s Dis is quite consistent, since it has 2 copies of 4 different Cards. The Terror’s text is blank quite often, but Charette pairs with him well. The Logos is a little less consistent, but potentially more powerful. Scrambler Storm is an excellent card, and Foggify pairs with it nicely. Dysania can ruin opponents’ long term strategies or liberate some abducted allies, but is dead in a lot of match-ups. The Mars in this deck requires a little bit of finesse, since EMP Blast will blow up the Motherguns this deck wants to keep in play. Tunk will do most of the fighting in this deck, unless Zyzzix is left alone. Tendrils of Pain and Ammonia Clouds can help if this deck falls behind, but playing them will usually result in killing many of your creatures, due to their small size. This deck doesn’t particularly stand out in a crowd and seems to struggle with aember generation. There is enough disruption to stop opponents from running away with a game, and as long as your opponent hasn’t won, you have a chance. Misft is quite the accurate name for this deck. On paper, it doesn’t look like it would play terribly, but the Brobnar in this deck is such a mess that it really drags the rest of the deck down. The Martian portion of this deck has some play, and there is probably a dream turn with Ammonia Clouds and Martian Hounds that will only happen once in this deck’s existence. The Untamed in this deck has a lot of issues. Lifeweb has a lot of upside, but if the opponent has played three creatures, they have probably outnumbered your guys. Briar Grubblling is a good Target for Jammer Pack, but that is about the extent of his usefulness. This deck feels like a fun house mirror version of Kalibum. Both deck have a comparable number of creatures, but Kalibum has aember generation and its creatures have a larger impact when left on the board. This deck struggles to generate keys, and, uh, that’s the point of the game. 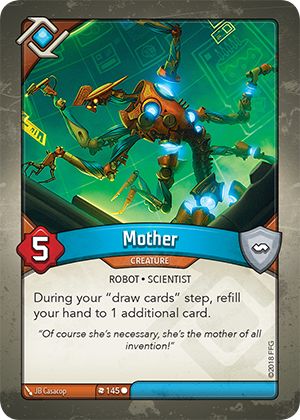 Known Errors: It can be easy to forget to draw the extra card for Mother after the turn she is played. You can also clear a stun even if you are not allowed to fight. Meta Info: Justin routed Nathan in this pod with five wins. This made up some significant ground, Justin now has 47 wins to Nathan’s 49. First and Second split the wins. First has 45 wins and going second has 51 wins. This was the first part of our Christmas Eve double-header. These decks felt like they were close in power level, and fairly evenly matched. The final spread of wins and losses were close as a result, which isn’t all that common with the format we use. We did experience some latency issues while streaming so the video was chopped up into a few pieces. One Sentence Summary: Zara suffocated Elaith under the weight of extra armor. 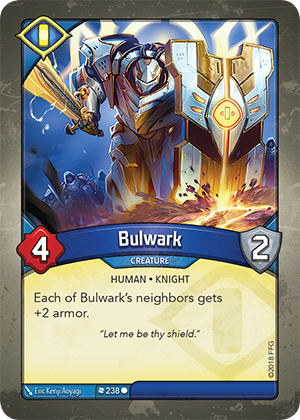 Bulwark prevented so much damage over the course of this game. Board control was pivotal to win here, and Bulwark was later joined by a Grey Monk to make Zara’s creature even more resilient. Notable Event: Troll picked up Mantle of the Zealot. Troll has one of the highest base powers and has a built in way to heal himself, so being able to use the Troll every turn was a huge boon. OSS: Hydrochanger kept drawing cards and killing creatures until it eventually won the game. Mother was played on turn one and stayed in play for the rest of the game. Mother was killed at one point, but a Phase Shifted Regrowth brought her back the next turn. This game went long, and so Mother probably drew ten or more extra cards. Importantly, Mother made sure that the deck cycled all the way through, since Hydrochanger needed to play a certain card twice. NE: The game ended on a Key Charge from Hydrochanger, who had to play it twice in this game to forge keys, due to the oppressive amount of stealing that It was capable of. OSS: The Martians invaded the board and overstayed their welcome. 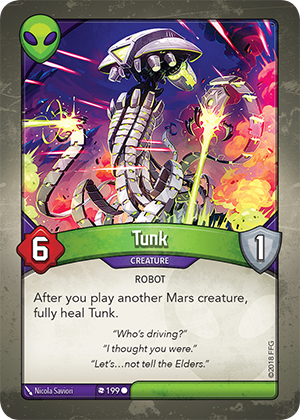 This wasn’t a flashy card this game, but the two copies of Tunk allowed the Martians to kill a lot of important creatures. Tunk is very resilient, and this game showed that card advantage can be measured in different ways. NE: Elaith was down 2 keys in this game, but the Martian presence in the middle of the game carried it to victory. Ulyq Megamouth was letting Commander Remiel activate who in turn let Halacor activate. OSS: It who Tackles Duty generated enough aember to forge through Lash of Broken Dreams twice. 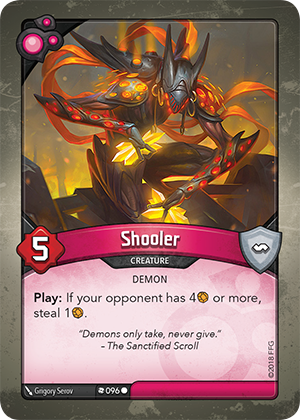 Shooler is an underrated card, and he stole a lot of aember in this game. The demon might not get much of a chance to be highlighted again, but this was a good game for him. There were other cards that had a larger impact, but the two copies of Shooler stole aember at the right time to keep Zara from forging at key times. NE: Zara had control of the board for the entire game, but stealing effects are powerful enough to keep you in a game that you feel like you are losing the whole time. OSS: Elaith and It Who Tackles Duty could have settled this score faster with Monopoly. Before this pod started, we weren’t sure that this deck could use the three copies of this card effectively. This game proved to be the best possible scenario for this card. Elaith had a full board for this whole game, and Cooperative Hunting did more than twenty damage (and probably more than thirty). NE: It used Oubliette to remove Hunting witch on turn two. This backfired as Elaith was able to Mimicry twice with a Witch of the Eye to remove Carlo Phantom and Nexus from the game. With Hunting Witch stuck in a hole, Elaith had to generate aember the hard way for the rest of the game. OSS: Zara slaughtered every creature that Hydrochanger sent to the battlefield. 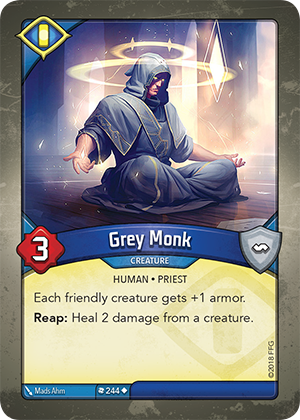 I’ve certainly highlighted Grey Monk before, but this game showed how a single point of armor can really swing a game around. The early and mid-game were dominated by fighting with creatures of the same size, but Zara’s creatures were left on the table when the dust settled. NE: There were several turns that played out the same but with different cards. Relentless Assault, Potion of Invulnerability and Grey Monk all did their part to kill creatures and keep Zara’s creatures on the board. This deck won the games it controlled the board and got crushed in the game it could not. The key to controlling the board with this deck is a combination of Tunk and Halacor. The deck relies heavily on its creatures to generate aember and Commander Remiel and Ulyq Megamouth really help with that. If Remiel and Megamouth are on the board together, Elaith’s ability to use creatures efficiently increases significantly. 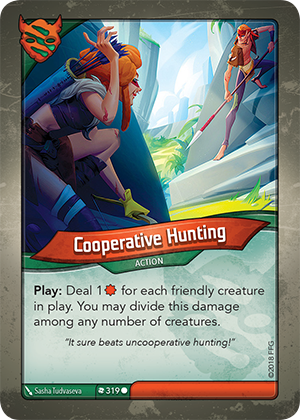 Cooperative Hunting over-performed in this deck, which is good since there are three copies. This deck has a few aember control cards, and some of them are very powerful. Doorstep to Heaven is a Get-Out-of-Jail-Free card, and Phylyx the Disintegrator is too dangerous to be left alive. Murmook and Grabber Jammer both tax your opponent and individually can be enough to stop a key. This deck doesn’t do anything really unfair, but seems to perform consistently. Zara kept control of the board in all three games tonight, but proved to be vulnerable to stealing effects. Similar to Elaith, this deck performed similarly in the games it played. The creatures in this deck are pretty big, and fight for the board extremely well. Grey Monk and Bulwark both make Champion Anaphiel and Troll into resilient threats. There were no true board wipes in this pod, so it remains to be seen if this deck would perform as well versus Gateway to Dis, but the extra armor would help with against the damage based sweepers like Poison Wave and Ammonia Clouds. This deck did not generate aember quickly, so it does seem vulnerable to decks that don’t care about the board and just pile up aember. 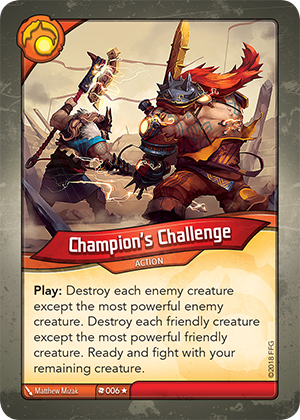 Charette and the Lash are the decks best ways to stop the opponent from scoring quick keys. The Brobnar in this deck can generate a surprising amount of aember between the Headhunters and the Warchest, but this requires creatures to fight. Wise opponents might discover the best strategy against Zara is to not play into this deck’s strengths. The Logos in this deck is very strange. The three Foggify’s do a lot to keep your creatures alive but there are only two Logos Creatures. 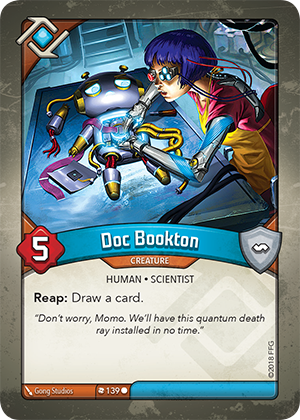 The Labworks and Phase Shift do a lot to smooth out draws, but for the most part the Logos in this deck doesn’t do much to advance this deck’s board position. Mother was key to the this deck’s only win, and it does feel like this deck will lose games where it plays the same amount of cards the opponent does. The Brobnar in this deck really miss a way to get into the fray immediately. It does seem like Brobnar decks without Anger, Gauntlet of Command and Ganger Chieftain are at an extreme disadvantage, and only Hebe the Huge and Smaaash in this deck give this deck an immediate board impact. Tireless Crocag is awesome, but there’s no way to heal him in this deck, so he will usually kill two creatures before getting tired. Key Charge is always welcome, and Witch of the Eye and Teliga are both must-kill creatures. Flaxia is hit or miss in this deck, but there are a lot of Untamed creatures, so it is possible to play several in a turn before Flaxia comes down for the bonus. Murmook and Grenade Snib are the only ways to interact with the opponent’s aember in this deck, and that is a big problem. There is nothing here to punish your opponent from gaining as much aember as possible, so this deck will often find itself in a race. This deck was a Key Charge away from making to the next round. There is an annoying amount of stealing in this deck, and even the Untamed helps with that. One big weakness of this deck is that there are a lot of creatures that have powerful effects and small bodies. Truebaru and Shadow Self can help protect them, but without them this deck struggles to keep anything on the board. There is some pretty solid synergy between Guardian Demon and Vigor with Shadow Self, but once again, its hard to keep anything on the board. Carlo Phantom is not at his most powerful in this deck, since he is better if there are Shadows artifacts so that he can use his ability immediately. 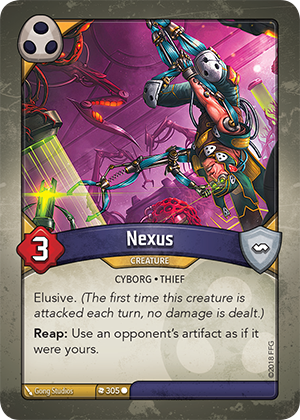 Nexus is a card that continues to impress, and having two is even better. Inka the Spider is a cool card with a lot of play, but the fragile body means that Inka doesn’t stick around for very long. There are a lot of synergies in this deck, but there’s not a lot of overlap. Inka and Carlo will never get the Vigor extra bonus. There is no direct damage to help Save the Pack, and Shadow Self and Truebaru are vulnerable to it. Known Mistakes: In game three, Nathan played a Hebe the Huge and forgot to damage one of his own creatures. Meta Info: Nathan increased the lead with the results from this pod to 48 wins while Justin has 42. Going first did a little catching up, and now only trails by 6 games at 42 wins to going second’s 48 wins. The first pod of our holiday streaming blitz featured a deck that was much better than the other three and a deck that was much worse than the other three. The middle two decks were evenly matched, and a few cards falling either way would mean that one or the other would have qualified over the competition. These games ran a bit long due to the fact that there were a lot of board wipes and ways to control the opponent’s aember. One Sentence Summary: Everything changed the day the Martians arrived. This card fueled the Martian engine late in the game. Portal allows the Martian player to hammer home on Mars again and again while still having creatures to play. Notable Event: There was a turn with Relentless Assault, Ganger Chieftain and Wardrummer that could have been played about a thousand different ways. After that turn, the game went south for Citizen, so that turn was probably pivotal. OSS: Shackleton made a game out of it, but the game was an exercise in delaying the inevitable. This card hit a Burn the Stockpile, ensuring that a key was allowed to be forged. NE: A Lifeward ensured that Shackleton couldn’t commit more resources to the board early on and made sure that Shackleton stayed on the back-foot for the rest of the game. OSS: Ratring came close to averaging a stolen aember a turn. This was only in play for two turns, but it stopped Annie from forging two turns in a row. This essentially turns any creature into a combination of Noddy and a Dew Faerie. If it is played on a creature that has another reap effect, then that creature has to be killed by your opponent if they want to play the game. NE: Between the Poison Waves and the Ammonia Clouds, there wasn’t much of a chance for low power creatures to hang around on the board. OSS: Shackleton let Citizen build up a false sense of security before winning with Citizen’s own card. Yep. This card again. Mimicry is just an incredible card, is unparalleled in its versatility. In this game it wiped the board while Shackleton was incredibly far behind. NE: The Mimicry play was the big swing that Shackleton needed to stay in the game, and there was a Coward’s End in the discard pile with the Spirit’s Way. The decision was kill all but one creature with the Way or kill all and take the chains. OSS: When both decks have a lot of creatures but not a lot of aember generation, the game is long and grindy. This was played quite a few times during the course of this game, and it cleaned up a lot of problem creatures each time it was played. NE: There was a turn where Shackleton could have used Nepenthe Seed to play Lifeweb twice, which would have significantly shifted the aember balance, but it wasn’t used. Shakleton had Burn the Stockpile in the discard pile so its possible it was correct to hold the Nepenthe Seed to threaten that. OSS: Ratring extorted the poor Citizen. 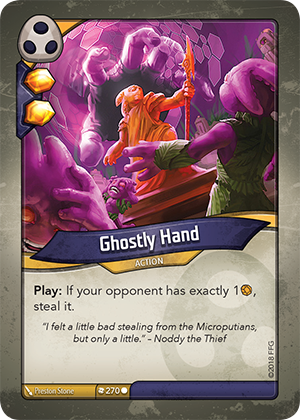 This is another card that’s been highlighted before in a previous pod, but it forced Citizen to pay 18 to forge two keys. That made all the difference in this game. NE: A Cleansing wave was played for five, which is a significant amount of aember, but the Lash taxed Citizen’s keys heavily. The Shadows portion of this deck does not steal as much as other decks seen in our tournament, but it was certainly violent. With two Pit Demons, Ratring doesn’t have to rely solely on the shadows to control the opponents aember. A Gateway to Dis is always nice to have access to. The Brobnar in this deck is very medium, but Burn the Stockpile and Bumpsy do some work. This deck doesn’t have a lot of aember burst, but it makes up for that with a solid board presence and smothering aember control. Not the flashiest deck that we’ve played, but Ratring’s record speaks for itself. Annie has an impressive Mars selection of cards. The Dominators can protect Zyzzix and John Smyth and two Squawkers are a nice addition. This deck is relying fairly heavily on Shadows to keep the opponent from outright winning. With that said, the Shadows in this deck is capable of quite a burst of aember. Smiling Ruth doesn’t seem to be a particularly good card, and we didn’t see her ability used in this pod. The Logos in this deck speeds the deck up, but does rely on having creatures on the board to generate aember. Annie has a lot of creatures, so if it loses the board then generating aember gets more difficult. Shackleton slightly under-performed in this pod, but this is a mid-tier deck based off the power level of a few cards. The deck isn’t quite coherent enough to be consistent, but Mimicry will just steal a game. The Brobnar in this deck will keep the opponent’s creatures stunned forever, but without a true board wipe, it can be hard to clean up all excess dudes laying around. Lifeweb, Murmook and Ritual of Balance provide a surprising amount of Aember control from Untamed, and paired with the Play effects from several Shadows creatures provides a moderate amount of disruption. The deck is missing some of the oppressive Shadows cards, and the deck is filled with tiny creatures with no great ways to protect them. If this deck is on the offensive, there is a lot of skirmish to keep the creatures sage. This Citizen should probably practice Keyforge if it wants to be taken seriously. The major drawback to this deck is the lack of aember control. There are only a pair of Sequis and a Raiding Knight to stop your opponent from running away with a game. Too many times this deck would fall behind and have no way to actually stop the opponent from racking up as much aember as possible. This deck did fine while competing for the board, and Coward’s End is a solid wipe for this deck. Mantle of the Zealot is awesome on Troll, Inka the Spider or Dew Faerie. The deck is really missing a Full Moon or Hunting Witch to take advantage of the three Niffle Apes and Troop Call. This deck is heavy on creatures, light on aember and not very efficient. I think you can do worse than this deck, though, and it probably has some good match-ups out there. Known Errors: At some point I lost track of how many times each of us had gone first, and so the spreadsheet is wrong about that. That’ll get corrected in the next few days. There are several situations where we forget to grab an aember from a card that we’ve played, but usually Twitch Chat is there to remind us. Also, Bad Penny is easy to forget, even after all the games we’ve played. Meta Info: Justin and Nathan split the wins for the night, so Nathan maintains his lead at 44 games to Justin’s 40. Going first lost some more ground, and is now at 38 wins to going second’s 46. This pod marks the half-way point for the first round. The games tonight were really close, with most of the games coming down to both decks being able to forge the last key within a single turn of each other. Several of the games came down to a decision: which card do you play around? One Sentence Summary: The Horsemen proved that they aren’t all hype. This game wasn’t really close, but the Horseman of Famine did a number on Norfab. The Horsemen don’t generate aember all that well, but using Famine to reap and kill opponent’s creatures is brutal. Notable Event: Oath of Poverty was used to destroy Soul Snatcher before it could become a liability. Soul Snatcher was particularly good in this match since Patron’s creatures outnumbered Norfab’s the whole game. OSS: Despite controlling the board for most of the game, Drone struggled to generate enough aember to win the game. This card is a powerful way to get some use out of your guys immediately. 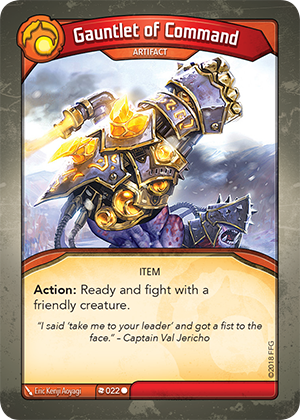 In this game, with board control slipping away, Ivory was able to use this to take out problem creatures. NE: Hebe the Huge crushed three elusive Mars creatures into paste early in this game. Those Martians represented a huge amount of Aember control that Ivory would have struggled to overcome. OSS: The Patron charged back from 2 key deficit to win this game. This card generate the aember swing that allowed Patron to get back into the game. NE: Drumble showed up at the end of the game to finish off Drone. OSS: Norfab fiddled with gadgets while Ivory stacked aember to the ceiling. Ivory played two copies of Remiel in this game and this allowed Dew Faerie and Krump to activate during Sanctum turns. Remiel’s extra activation accounted or 6 aember, two dead creatures and 1 destroyed aember. NE: A Key Charge put this game away before anything resembling a comeback could be assembled. OSS: The Horsemen made a show of it, but fell short in the last few turns. This card has been highlighted before and I promise you, it will be highlighted again. Key Charge won the game through an activated Lash of Broken Dreams. NE: Drumble was played to try to win the game for Patron, but a Lost in the Woods made sure the captured aember was returned. OSS: Norfab played the game of its life. This card kept Drone’s board under control despite the fact that most of Norfab’s creatures where abducted or destroyed in the first few turns. This combos well with Logos creatures like Batdrone or Quixo, and is Logos’ best answer to big creatures. NE: An early turn from Norfab saw a Phase Shift-ed Irradiated Aember combine with two Anomaly Exploiters to kill five of Drone’s creatures. Then Effervescent Principle destroyed three aember. Custom Office deserves an honorable mention for its performance in this game, since Drone was stuck with two Screechbombs and a Mighty Javelin in hand at the end of the game. The performance of this deck is a little bit surprising, and its possible the rest of the pod was a little bit weaker than average. This deck won most of its games on the back of Key Charge and a pile of aember burst. Two Nepenthe Seeds are just silly, and allow this deck to play Virtuous Works or Smith over and over. The Sanctum and Brobnar do a solid job of competing for the board. There is just enough disruption to keep your opponent off a key or two, which is usually enough time for this deck to generate more aember than your opponent can deal with. Tireless Crocag, Sigil of Brotherhood, Gauntlet of Commands and the Commander Remiels are good at providing use of off-house creatures. The maverick Effervescent Principle is not a hindrance on this deck, and provides a nice surprise. The Untamed portion of this deck feels like it has the wrong mix of cards, since it only has one more creature than Full Moons. This is a solid, above average deck that gets a lot of use out of the Horsemen. There is a decent amount of cross-house synergy, since Veylan Analyst makes your Dis artifacts have even more upside. Knowing when or if to play Soul Snatcher is a skill testing part of this deck, but having Oath of Poverty to destroy it is nice. This deck has a respectable aember control suite of Lash of Broken Dreams, Drumble, Interdimensional Graft, Pit Demon, Dextre and Shooler. Those cards need a little bit of finesse to really hurt the opponent, but there are a lot of situations where just any one of those cards is enough to swing a game. This deck is a B+ deck that plays a fair game, but I feel like there are a lot of unfair decks that this deck couldn’t compete against. This deck is a lovable mess. There are almost as many artifacts as creatures in the deck, and the only way this deck can seem to win is if the opponent does little to stop your aember generation. Double Phase Shift is exciting and the deck seems to be doing its best when abusing them. I never thought I would think a deck needed Vezyma Thinkdrone, but this might just be the one time I will suggest that. For the most part, this deck feels like it is half of a combo deck. Its also rare that the Mars portion of a deck feels like it is the best part of the deck. This deck is impressively dysfunctional and I honestly can’t believe it won the one game that it did. This deck lost two heartbreaking games and then lost to an objectively bad deck. Its difficult to pinpoint exactly what doesn’t work with this deck. This deck doesn’t have a lot of aember generation, and relies on its creatures to do most of that. Its aember control is modest, but since most of it is captured related, a lot of that aember can be reclaimed. One drawback of the Brobnar portion is that there are no ways to get your creatures into the fray immediately, so you are often letting your opponent get the first chance to swing. This deck does have an impressive amount of abduction, so it does well at getting rid of creatures in a way that you never have to deal with them again. 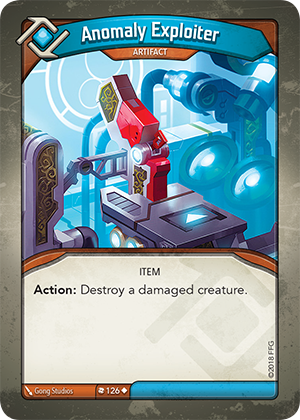 Known Errors: Dextre goes to the top of your deck when he is destroyed. He and Bad Penny have a habit of not going to the Zone they are supposed to. Meta Info: This night was split down the middle for both players and turn order. Nathan maintains a lead over Justin, 41 wins to 37. Going second has 42 wins to first’s 36.